…tales from a lesser lady novelist. 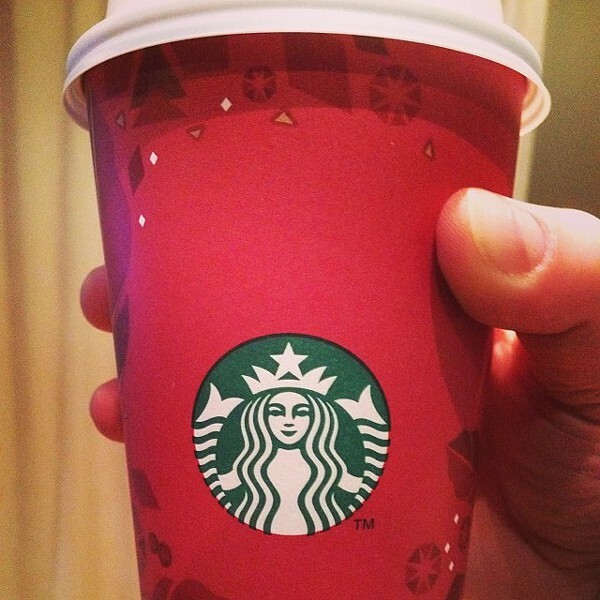 The ‘brew-haha’ that recently percolated over the 2015 Starbucks holiday cup reminded me of the ever-popular accusation that Starbucks’s logo depicting the legendary Mélusine is ‘in fact’ a demonic image. Historically represented as a bare-breasted woman with the lower body of a serpent, fish, or a dragon, Mélusine is the French name of an ambiguous, female archetypal figure whose mutable nature continues to intrigue scholars—and in some cases alarm a certain portion of the population on this side of the Atlantic. It was the ‘mermaid chick’ that caught my attention, on two accounts; first, because I was born in the former Czechoslovakia (now the Czech Republic) where Mélusine has long been a part of folklore; second, her legend plays a role in my two historical novels, The Sixth Surrender and its sequel, The Serpent’s Crown. Both novels are set partly in a region of France from where the Mélusine legend emerged and with which she is associated. In my novels, Mélusine has no connection to anything magical or paranormal. She serves as a metaphor for the real and fictional characters’ struggle to find their own identity, acceptance, and a measure of simple human happiness in the volatile and violent world of 13th century France and beyond. At that moment, my child’s imagination conjured up a sad, gaunt woman in trailing a long, white, tattered gown, snaking around the chimney amidst great gusts of wind, her mouth open in a wail. I do remember that I felt sorry for her, for someone who cannot find the comfort of home and warmth and security. I recall quite clearly that none of us had the urge to do anything more demonic than to throw another log into the woodstove, and to listen to the haunting sound outside in the snowy darkness. I didn’t know it then, but Mélusine had in fact been already domesticated, far from her own homeland. The legend of Mélusine, a mysterious half-serpent woman and her marriage and progeny continues to draw a keen interest from students of history, linguistics, psychology, anthropology, literature, and mythology on both sides of the Atlantic. In literature, she popped up more recently in A. S. Byatt’s Possession. Although her anthropomorphic form may have originally sprung from a primal ‘collective unconscious’, in more recent historic times, the serpent, or worse yet, a female with a serpentine body, has become part of a different cultural consciousness. In a fascinating study of the alteration—and demonization—of ancient symbols, The Alphabet versus the Goddess, the conflict between Word and Image, author Leonard Shlain, reminds us that “Western culture has long reviled the snake, associating it with evil and temptation. But at the dawn of civilization the snake was a positive symbol of feminine energy.” The snake—and the female—was also associated with the earth, nature, healing and wisdom, attributes which Western culture still has trouble acknowledging let alone accepting. Like Mélusine’s appearance, her name is also mutable and she has borne different names in different parts of the world. In contrast to some places, those living in Poitou, in the pays de Mélusine, unabashedly claim her as their homegrown patroness—although other regions of France claim her as well. From there, her legend has spread to Spain, Germany, England and Eastern Europe—and the U. S.
An entry in The Women’s Encyclopedia of Myths and Secrets identifies Mélusine as the medieval version of the fish-tailed Aphrodite, with an ancient shire at Lusinia (modern Lusignan), named after her as “Lady of Light”. During the church’s crusades against the cults of love in southern France, Mélusine legend made her the mystic bride of Raymond, Count of Poitou. She married him on the condition that each Sabbath she must remained in seclusion in her bath. She there became a fish-tailed mermaid and spent the day in her bath. In the Encyclopedia’s entry, it is “churchmen” who discovered her and either killed her or drover her from the castle. She returned each night to suckle her “children,” probably interpreted to mean the people themselves. She also served as a prophetess of death when she wailed around the ramparts of Lusignan castle, a king would die—or the lord of the castle. In the numerous circulating versions of her story, Mélusine usually appears at a forest spring as a beautiful, ‘other-worldly’ woman who marries a mortal man on the condition that he will not see her in her Saturday bath. The association of Mélusine with water is not an accident; as Shlain reminds us, water is the symbol of femaleness. In their happy marriage, Mélusine helps her husband found a prosperous seigneurie and bears him several sons who strike out on their own to found their own kingdoms in various parts of the world. Their happiness ends when her husband breaks his pledge of trust and peeks at her during her bath to discover that she has—a tail. With her secret discovered, she cries out, and condemned to remain in the form of a winged serpent or dragon, flies away never to return except appearing as a banshee to her descendants, or when the castle changes lords, announces their impending death by her mournful wail. To me, the really interesting part is her role as a political allegory of the rise and fall of two dynasties, at two different times, and her subsequent absorption into the Czech folklore. The Mélusine legend was already extant in the oral tradition of the 11th and 12th centuries when it was used to account for the ascension of the Angevins, particularly Henry II, Eleanor of Aquitaine, and their famously infamous family. In The Devil’s Crown, a history of Henry II and his sons, Richard Barber makes the point that in the Middle Ages the Angevins were linked to this legend of the beautiful, powerful, and unearthly lady. In a society that believed in a fixed social order, the legend served to explain to contemporaries that family’s rise to power. As Barber puts it, the counts of Anjou, “noted for their fiery temper and ruthlessness, could only come from the devil, and so their line was traced back to a demon ancestress, wife of Geoffrey Greygown, one of the earliest counts.” This countess was naturally beautiful but refused to come to Mass and when held by force, she slipped out of her cloak and flew out the window with a terrible cry, never to be seen again. In that context, Mélusine could be seen as a negative presence. Toward the end of the ‘calamitous 14th century, however, she emerges in a far more positive and interesting role than in the Angevin legend, this time associated with a different Poitevin family. For those who see Mélusine as the Lusignans’ totemic ancestress, the origins of that family are equally murky. They emerged from the plains of Poitou somewhere in the late 10th, early 11th century and over the years they beat and browbeat lesser neighbors, married themselves into more powerful families, and became the kings and queens of Jerusalem, Cyprus, and Armenia. The main branch of the Lusignan died out in 1308; the Armenian branch continued until 1375 when Leo VI was dethroned and died in 1393. Their longest rule in the Lusignan kingdom of Cyprus lasted until 1473 when Venice claimed it. The Lusignans were not shy about linking themselves to this ambiguous creature. The image of the winged Mélusine, tail and all, mouth open in a cry, stares down from the church of Notre Dame et Saint Junien, built in Lusignan by Hugh IV, le Brun cca. 1024. 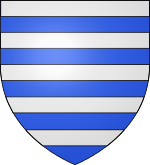 Some ascribe the Lusignans’ armorial bearing of silver chevrons on blue (burelée d’argent et d’azur) is intended to imitate her tail scales. One historian explains that “[T]he significance of the attempt by the Lusignans at linkage with a supernatural being has to do with Mélusine’s origins as a Celtic deity. For the inhabitants of Poitou—Pictavia—land of the Celtic Pictones in pre-Roman times—Mélusine was the anthropomorphic representation of the sovereignty of the land whose right and privilege it was to recognize and form union with the legitimate ruler of the territory.” Others point out that Mélusine refers to “mère [mother] Lusine” from which the Lusignans derive their name, among other suggested derivations. Some 300 years later, Mélusine received a resurrection in a literary tradition that emerged during the political struggles of the Hundred Years War (1336-1433), and the attempted revival of the crusades by Leon de Lusignan of Armenia. It was at that point that she first acquired her connection to the Czech lands. In the late 14th century appear two versions of what is generally called Le Roman [Le Livre] de Mélusine ou [La Noble] Histoire des Lusignan. One version became incorporated in 1393 into a ‘romance’ written in a prose style by Jean d’Arras. His Roman de Mélusine was written at the behest of the Jean, Duc de Berry and his sister Marie of the House of Luxembourg—which claimed descent from the lords of Lusignan. Shortly thereafter, in 1401, Mélusine appears in a poetic version by someone called Coudrette (various spelling). Both of these presentations form a part of political propaganda when the French tried to conquer Poitou/Aquitaine, and the English tried to hang on to the remnants of the domains brought to Henry II by Aliénor of Aquitaine. In these later versions, Mélusine and her link to the Lusignan family are again used to legitimize one dynasty’s territorial claims over another’s. And here is where real history becomes more solidly entwined with the legend. Jean de Berry and Marie de Luxembourg were the grandchildren of John of Luxembourg, the Blind King of Bohemia—much later Czechoslovakia, now the Czech Republic. The son of the Holy Roman Emperor, John of Luxembourg became the king of Bohemia by his marriage in 1310 to Elizabeth Premysl, the daughter of the last king of Bohemia. Their daughter, Bonne of Luxembourg, was Jean de Berry’s mother. John of Luxembourg turned out to be a bad husband and a bad king who spent the kingdom’s wealth on foreign adventures—like championing the cause of the French, and the eventually victorious Valois kings, who sought to regain Poitou from the English. Unlamented by his subjects, John of Luxembourg died fighting on the French side at the Battle of Crécy in 1346. Bonne de Luxembourg married John, the heir of Philip VI of France. Bonne died in 1349, a year before her husband became king as Jean II. Their children included Charles V of France, Louis d’Anjou, Jean de Berry and Marie de Luxembourg. On the brighter side, John and Elizabeth founded a dynasty which ruled Bohemia from 1310 to 1437 and produced one of the more spectacular medieval rulers in the person of their son and Bonne’s brother, Charles IV, King of Bohemia and Holy Roman Emperor (1316-1378). He is the man behind Charles University in Prague, the St. Vitus cathedral, and the Charles Bridge; Emperor Charles also spent some years of his youth living in France at the court of his uncle, the king of France. By contrast, the version of Mélusine presented by Coudrette was commissioned by Guillaume de Parthenay (the name varies) a powerful Poitevin baron and ally of the English, and a strong adversary of the French during the Hundred Years War. He is described by Matthew W. Morris as “among the fiercest of the rebel French barons determined to end Valois rule: The Parthenays of Poitou.” William of Parthenay also belonged to one of the collateral branches of the Lusignans. As is common in history, it is an ironic twist that 14th century Poitevins defended their ties with the English when some 300 years earlier they had fiercely resisted the imposition of Anglo-Norman system of governance which Henry II, Richard, and John Plantagenet attempted to impose on them. 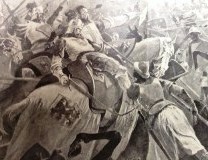 As a result, in the 14th century the versions of the Mélusine legend fused the elements of actual history of the Lusignan clan in Poitou, Cyprus, the Holy Land, and in Armenia in order to legitimize the territorial claims of the Luxembourgs and the Valois against the English—or of the English against the French. They also linked the Luxembourgs’ succession to the Bohemian throne via the Mélusine legend of their Lusignan ancestors. In the Jean d’Arras narrative, which freely blends facts with eye-popping stories of marvels, Mélusine and her husband have several sons who are described brave and resourceful warriors and good husbands and fathers, even though they are monsters in appearance—a fact which their wives don’t seem to notice or mind. Since those deformities could have led credulous 14th century readers to conclude that the Lusignans (and therefore the Luxembourgs) had a demonic ancestry, the author has Mélusine exhort her sons to Christian behavior, and to demonstrate repeatedly her Christian faith and piety. Some students posit that besides championing the Luxembourgs’ claim to the pays de Mélusine, d’Arras aimed to underscore to his contemporary audience the Church’s lessons in redemption. D’Arras also introduced two of Mélusine’s sons, Antoine and Renaud, to provide a direct connection to the Luxembourgs and the Bohemian crown. In subsequent versions, Antoine’s and Renaud’s stories are usually omitted, but they play an important role in establishing dynastic territorial claims because d’Arras has Antoine marry the daughter of the Count of Luxembourg, and thereby gains that position, and Renaud marries the daughter of the King of Bohemia. Antoine and Renaud and their brothers further gain fame in the Holy Land, Cyprus, and Armenia as defenders of Christianity, a story line which incorporates the Lusignans’ own crusading heritage in that part of the world. As a result, the Mélusine legend, removed from the pays de Mélusine, ties together the histories of the Lusignans of Poitou, Jerusalem, Cyprus and Armenia, and the Bohemian Luxembourgs. 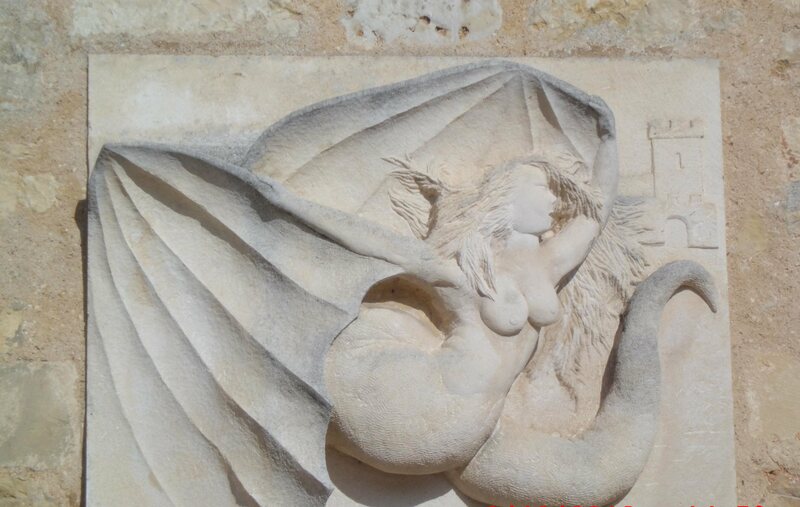 Recent research by Professor Martin Nejedlý of—where else—Charles University—traces the Mélusine legend to the Czech Republic where the ‘mermaid chick’ becomes a ‘Czech chick’. Mélusine received what Nejedlý calls her ‘second life’ thanks to the translation of Coudrette’s work into German by Thüringem von Ringeltinge in 1456. In 1555 the work was printed in translated form in the Czech language, and thereafter enjoyed 300 years of popularity in various editions. These versions, however, lost or omitted its former historical and genealogical connections to the Lusignans and the Luxembourgs since their story was no longer relevant to succeeding rulers. Not surprisingly as well, as had happened in France, the legend also blended with Czech regional traditions which took numerous forms, becoming in many instances a fairy tale about a beautiful maiden with happy, sad, or bittersweet endings. She continues to appear in children’s fairy tales. She gives her name to mountain peaks (Melusine Peak, 1,097 m) appears in legends attached to certain castles and natural rock formations, and continues to be associated with springs and wells, forests, and nature. 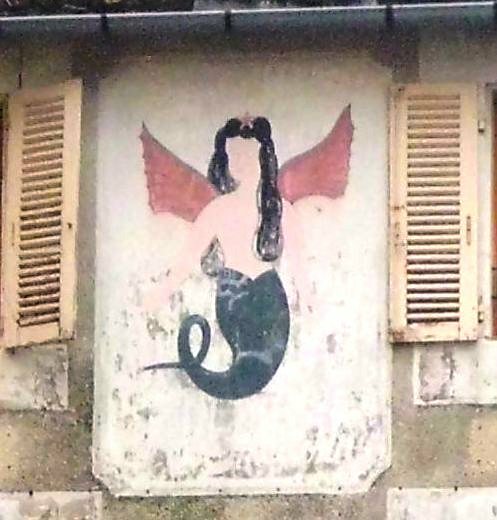 As a result, in the the 21st century, the ‘mermaid chick’ lives not only as a logo for an American coffee company; she also lives, and quite happily, far away from her homeland from where the long dead Luxembourgs borrowed her and where for centuries she had protected the lords of Lusignan. So next time you are inclined to go to Starbucks for a bit of ‘satanic latte,’ raise the cup and think about the Luxembourgs of Bohemia and the Lusignans of Poitou instead. Richard Barber, The Devil’s Crown, a history of Henry II and his sons (BBC 1978; publication to accompany the TV series). 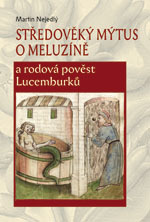 Melusine of Lusignan, Founding Fiction in Late Medieval France, ed., Donald Maddox & Sara Sturm-Maddox (U. of Georgia Press, 1996). Mathew Morris, “Jean d’Arras and Couldrette: (sic) Political Expediency and Censorship in Fifteenth-Century France,” Postscript, v. 18-19. Jonathan Riley-Smith, “The Crusading Heritage of Guy and Aimery of Lusignan,” Cyprus and the Crusades, Papers given at the International Conference “Cyprus and the Crusades”, Nicosia, 6-9 September, 1994. I am a historian who writes 'history with a story' in off-duty hours. This entry was posted in book promo, history notes and tagged Angevins, Charles University, Coudrette, Czech Republic, demon, demonic, France, historical fiction, historical research, Jean d'Arras, Lusignan, Lusignans, Martin Nejedly, Mélusine, Parthenay, Starbucks, Starbucks coffee, The Serpent's Crown, The Sixth Surrender. Bookmark the permalink. Great to have such a wild tour of the legend, and the ongoing life of this wonderful being.